The American-born artist, John Hubbard, has lived and worked in England for over forty years. He is a landscape painter of an unconventional type, in that he fuses elements of Chinese painting and contemporary abstraction within the tradition of late 19th century European landscape sensibility. The result is work which conveys a strong sense of the feel of landscape, its essence and physical presence. As the New York Times critic wrote in 1986: "these are paintings to be savoured by those who like consistency in art". This site includes background information about John Hubbard and his work. A full chronology of the artist's career from the 1960s to today is visible through the comprehensive visual database. Details of over 900 works are included. The site is regularly updated, offering you a chance to view new work. First time users may find it easier to browse via the Artworks page. Users can focus their selection using the search engine below. To purchase work or for general enquiries about John Hubbard please email the artist's estate. Short film about John's life and work, made for his exhibition at the Luther W Brady gallery in Washington DC during 2013. John talks about the process behind his extraordinary abstract impressionist paintings, and reveals a new talent for singing a selection of American folksongs he learned as an art student in New York in the 1950s. (opens in a new window). Click here to view a slide-show of the gardens at Chilcombe House (opens in a new window). This site contains a comprehensive visual database of John Hubbard's work from the 1960s to the present day. Use the search engine box below to access specific works by typing in one or more of the following: date (e.g. 1999), medium (e.g. oil on canvas), title (e.g. Tiled Garden) or place (e.g. Spain, Morocco...). 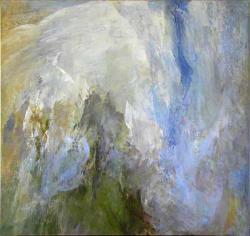 Refine your search by entering more than one of the above (oil on canvas, 1999). A full list of work can be accessed by clicking on List all works chronologically at the bottom of each page.